The Eat'N Tool is just a little too pointy for the pocket but comes with a handy carabiner clip for attaching the multi-tool to belt loops or other gear. The clip isn't load-bearing, and from my past experience with this type of clip, I'd recommend replacing that part immediately. 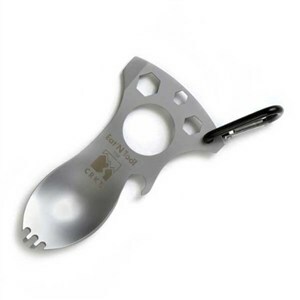 Otherwise, the Eat'N Tool seems pretty bulletproof, an ingenious stainless steel configuration that could replace your pack spoon and fork with something that works on simple mechanical problems as well as hot meals. The main part of the tool serves as either spoon or fork, although it's a much better spoon. At the side there's a bottle opener, and the rear portion of the tool provides three metric hex wrenches in 6, 8, and 10 mm sizes as well as a stout flat-blade screwdriver bit built into one corner. Use the large hole in the center of the tool as a single finger grip. While the Eat'N Tool won't solve all problems, it does provide more possibilities than the standard spoon and fork. If you're interested in multi-purpose items, this cuts weight and adds a few more tricks to your bag. It's not a tool you'd prefer over a good set of metric wrenches, but if this is all you've got when things go wrong, you can put up with a little awkwardness. See the Outdoor Cutlery Utensil Set from Sigg for a pocketknife style of camp cutlery that folds into a handy belt pouch.